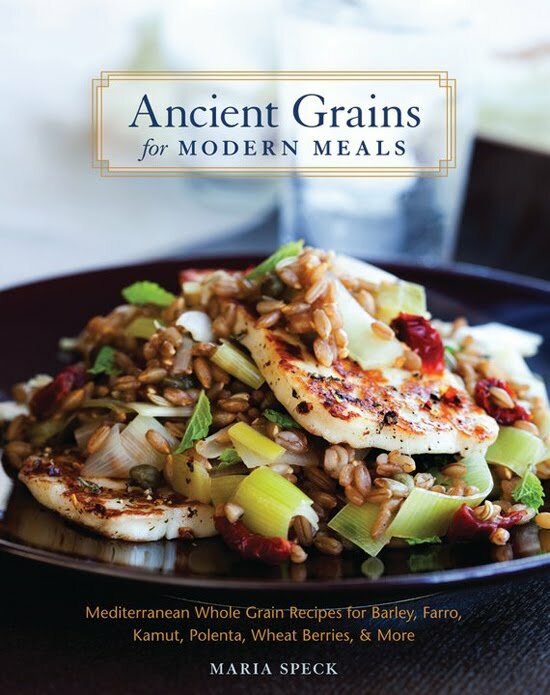 This was the first recipe I tried from Maria Speck's wonderful, new cookbook, Ancient Grains for Modern Meals last summer. We brought a small tub of this brilliantly colored quinoa to a barbecue and it was such a hit with everyone that I've made it several times since then. 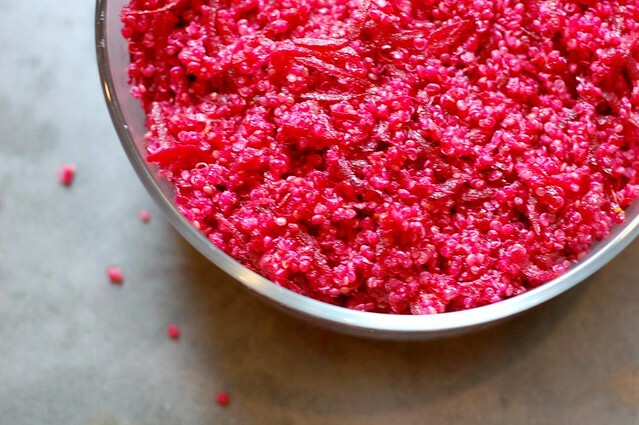 In addition to the gorgeous, ruby-like color, I was drawn by the idea of infusing the quinoa with cumin's exotic flavor and tempering it with the beets' intense sweetness. And I decided to take things one step further and use the beet greens in some quick curried chickpeas to add a little extra protein. Top the whole thing with some yogurt or raita and you're in business! 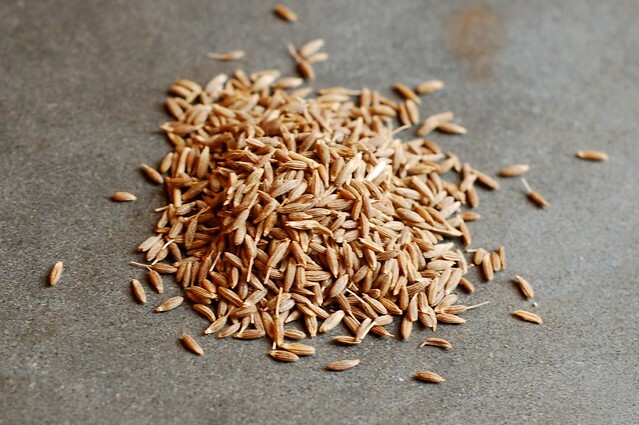 Cumin is one of the backbones of Indian and Mexican food and I use it often - I love its pungent, slightly earthy flavor. 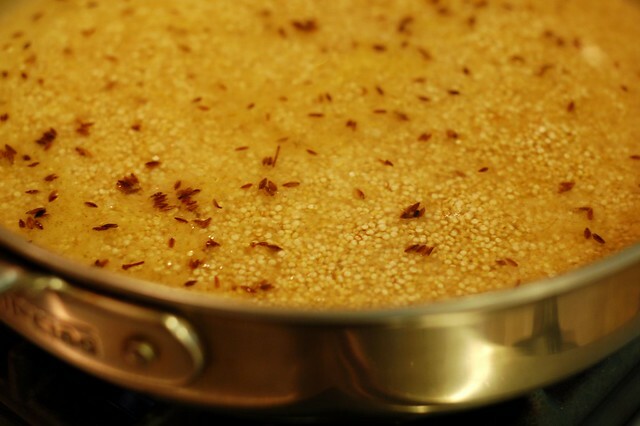 This recipe calls for simmering the quinoa with whole cumin seeds to impart some of that nice flavor to the grain. Check the bulk section of your healthfood or grocery store to find it whole. It should be cheap. I've come to love them raw - they're great in green salads, too. Crunchy and sweet! Mix them with the quinoa and you get a simply breathtaking dish - remarkably pretty and very appropriate for any upcoming Valentine's Day parties you might be going to. 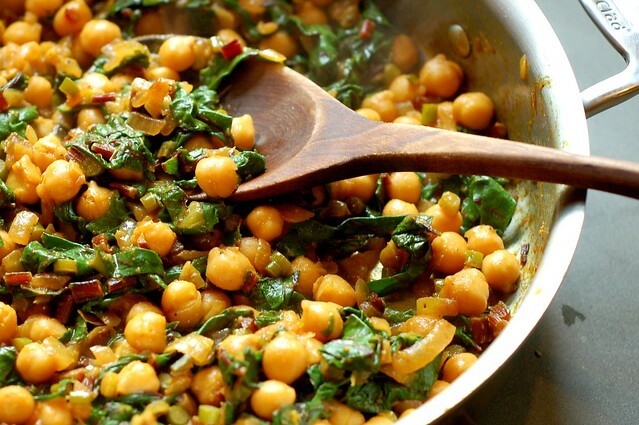 As for the chickpeas, these are quick and easy and mighty tasty. 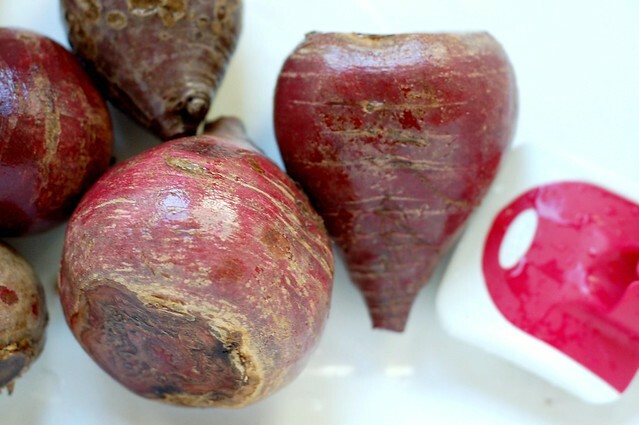 I washed the beet greens (no need to throw them away - they're also yummy and good for you.) Then removed the ribs to chop them up finely since they're tougher than the greens and cut the leaves into ribbons. Then I chopped up an onion and a bunch of garlic and sauteed them in some olive oil along with a pinch of red pepper flakes. Once the onion was translucent, I added the beet stems followed a few minutes later by the greens. Tossed in some spices, a couple cans of Eden organic (and BPA-free) chickpeas and let it all meld together, seasoning with salt and pepper, and voila -- a savory, curried mess of garbanzos and greens. 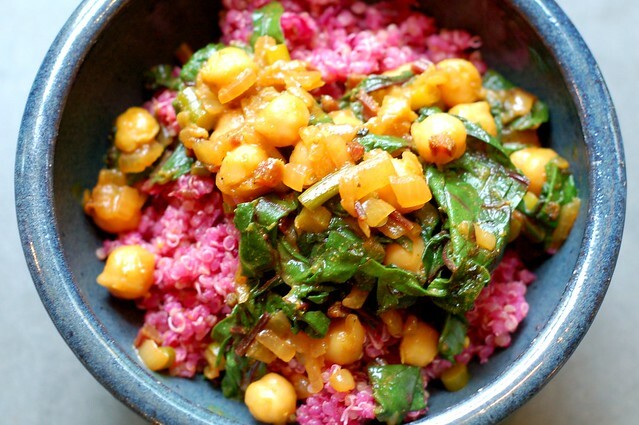 The curried chickpeas go very nicely with the nutty, beet-sweetened quinoa. 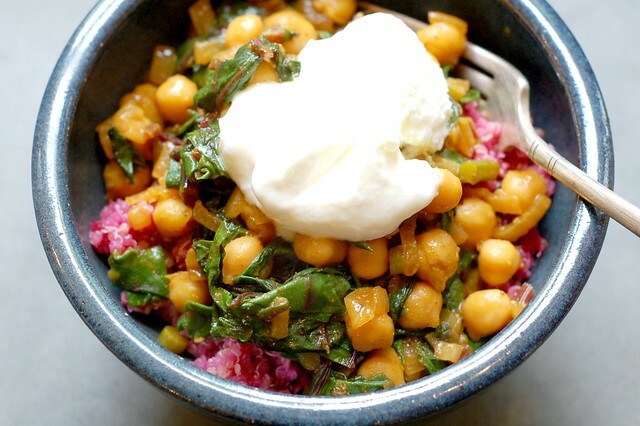 Top with a spoonful of yogurt or raita and you'll be glad if you've made enough to have leftovers - this dish only improves with a day or two's time to let the flavors deepen. Just a quick note that Maria's recipe calls for sumac which I did not have - you can substitute some lemon juice as I've done if you can't find this ingredient. 1. Heat the olive oil in a medium saucepan over medium heat until hot. Add the cumin seeds (they will sizzle) and cook, stirring, until the seeds darken and become fragrant, 30 seconds. 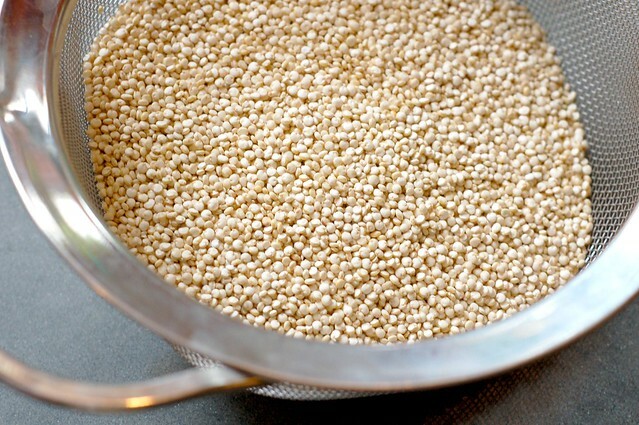 Stir in the quinoa and cook, stirring frequently, until hot to the touch, about 1 minute. Add the water, salt, and sumac (if you have it), and bring to a boil. Decrease the temperature to maintain a simmer, cover, and cook until the liquid is absorbed, 15 to 20 minutes. 2. Meanwhile make the chickpeas. Heat the olive oil in a large saucepan over medium heat until it shimmers. Add the onion and red pepper flakes and saute for 2-3 minutes until the onion begins to soften. Add the garlic and saute a few more minutes until it becomes fragrant. 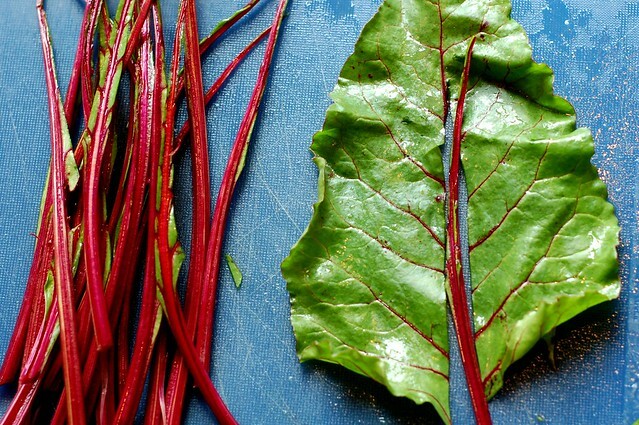 Add the chopped beet green stems, stir and saute for 2 minutes. Throw in the beet greens and stir, sauteing another 1-2 minutes. Add the chickpeas, curry powder or garam masala and any other spices you desire, season with salt and pepper and stir well. Cook for another 5 or so minutes, stirring occasionally, then turn off the heat and let sit. 3. 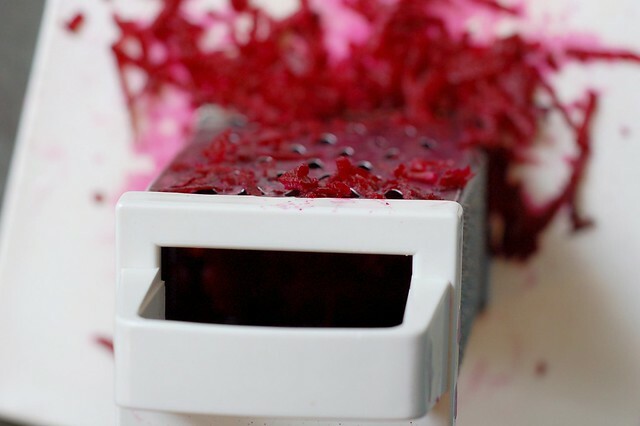 To finish, stir the shredded beets into the saucepan of quinoa, cover, and let steam for 3 to 5 minutes. Stir in 1 tablespoon of the lemon juice and the cayenne pepper. Taste, adjusting for salt and lemon juice, and serve topped with the curried chickpeas and the yogurt or raita. Want even more recipes, photos, giveaways, and food-related inspiration? "Like" the Garden of Eating on Facebook or follow me on Twitter. I am always looking for new ways to use quinoa. I like beets, but more so the greens instead of the root. Please keep posting innovative recipes as I am always trying new things! I nominated you for the Versatile Blogger award. I love your recipes and photos! Thank you!